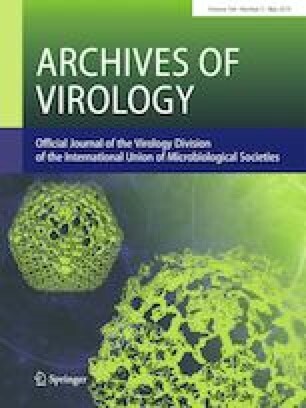 A new polerovirus species with the proposed name faba bean polerovirus 1 (FBPV-1) was found in winter legume crops and weeds in New South Wales, Australia. We describe the complete genome sequence of 5,631 nucleotides, containing all putative open reading frames, from two isolates, one from faba bean (Vicia faba) and one from chickpea (Cicer arietinum). FBPV-1 has a genome organization typical of poleroviruses with six open reading frames. However, recombination analysis strongly supports a recombination event in which the 5′ portion of FBPV-1, which encodes for proteins P0, P1 and P1-P2, appears to be from a novel parent with a closest nucleotide identity of only 66% to chickpea chlorotic stunt virus. The 3′ portion of FBPV-1 encodes for proteins P3, P4 and P3-P5 and shares 94% nucleotide identity to a turnip yellows virus isolate from Western Australia. The online version of this article ( https://doi.org/10.1007/s00705-019-04233-w) contains supplementary material, which is available to authorized users. This study was funded by Australian Grains Research and Development Corporation projects DAQ00154, DAQ00186 and DAN00202.